Ask fellow campers about "Oak Creek Campground" and nearby attractions. Online reviews of this park were really good, so I was glad she could fit us in for the weekend. When we arrived we had to pull up to the office to register and there is really no parking lot. Our site was behind us on the narrow road so we had to take their turnaround circle which is a little tight for a 42 ft fifth wheel. When we got to the site we found for that price we had no sewer hookups so if we wanted to dump we would have to go through the turnaround again! Music was going late into the night Saturday, til about midnight. Sites were tight, very close together, so close that when someone pulled in next to us it killed our dish TV. No room to swing a big rig when park is full, which it was both nights we were there. We were thinking we were going to have to try to back out, but found out our neighbors on both sides are also pulling out tomorrow. Also the site was just long enough for our RV and we had to park our truck on a lot about 150 feet away. They had cable but only 9 channels, most local so we weren't at all interested. People were very nice and considerate and the great thing is the Ark Encounter is only 19 miles away! Many full timers back in the park but they save the front for those of us who come and go. This place is surrounded by woods and many sites back up to the creek so that's nice. We camped at Oak Creek Campground in a Fifth Wheel. Ark Encounter which we highly recommend is only 19 miles away. We also drove 80 miles into Louisville, KY, to see Churchill Downs and the Kentucky Derby Museum. There is a huge RV supply place right up the road. Thank you for your review and we are glad you enjoyed our park. We hope to see you again in the future. You are correct we have 19 overnight spaces for Rvs. 5 of them are Pull Thru spaces however that range from 67' to 40' in length. 15 50/30/20 spots and 4 30/20 spots. We do FREE on site sewer pump outs for guests staying a few days or more. We also have a dump station. April till Oct we do stay at capacity so reserve early. We do not charge to change dates if needed. Again thank your for the review. Happy camping and safe travels. Unfriendly service! When you check in they take your money & then give you a map and you are on your own to find your site and manage to get backed in. The sites are mostly short and narrow back ins. The sites are narrow that we had to step out into the mud after a rain. Had to pull the truck & trailer out of the site to even get into it without walking through mud. 50 amp service was good. Poor cable & no WiFi service. Site was not mowed and was unkept. Long term renters are located in the back of park. Short term are crowded together in the front of the park. Thankful it was only for 1 night. We camped at Oak Creek Campground in a Travel Trailer. Like most Rv parks you check in and get a map and directions to your site. KOA and a few other do offer escorts. We can do this if asked. However our park is simple to navigate being small and we have signs everywhere. Our turn around sign literally says "This is your turn around" the next sign to get to the over night section is 2'X2' and says "Turn here for sites 1-20" We also tell every customer leaving check in if they need anything just let us know. As far as mud goes we had a very long winter, lasting until the first week of April with freezing temps. Then after the thaw we have had no more than 3 days in a row of dry weather. When it does stop raining we get alot of sun so the grass grows quickly. I personally mow each site and they get mowed at least 1 time per week. The mud is from campers rutting up the grass, we repair it asap. We brought in 15 tons of fill dirt and 30 tons of gravel this year in just the overnight area alone. Sites are at the shortest 40' long. We have a 21 foot truck pulling a 35 foot fifth wheel. 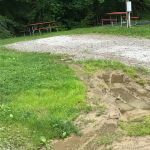 There are a couple of tight turns in this campground, but they are manageable with care. Plus, there are a couple of elevated spots which add to the aggravation, but we never bottomed out. That said, we found this a good location for visiting the Ark Encounter and Creation Museum and south Cincinnati. Campsites are gravel and close, but not tight. The transient spots are up front and that area has trees only along the creek. There is no sewer, but the electric and water were fine and our phones and satellite worked. The staff are friendly and helpful. There arent tons of camping options in the area, so if you are OK with what you read here then you will be OK staying here for a few days visit. We camped at Oak Creek Campground in a Fifth Wheel. The park is nice, clean & quiet. No highway noise here. Our site was right on a lovely creek! Staff was very kind. Website clearly states only water & electric hookups. You dump on leaving. They also had convenient parking for our car trailer. I would definitely recommend to others. We camped at Oak Creek Campground in a Motorhome. Between the Ark Encounter & The Creation Museum. Costco 15 minutes away. Campground was an adequate overnight stay when traveling through the Bluegrass state. Located a couple miles off the interstate, quiet and no highway noise. This CG is mostly permanent campers but has one row of gravel pull thru sites for campers just passing through. There are no sewer connection sites and the water was turned off since it was below freezing. Electric and cable worked fine. If you are self-contained, and only staying overnight after driving all day, this campground will work. We camped at Oak Creek Campground in a Fifth Wheel. Easy on and off of the interstate. Thank you for your review and we are glad that you enjoyed your stay with us. Our pull thru sites range from 65' long for space 1 to 38' long for number 5, they kind of taper down in length. Our back in spaces range from 42' to 72' in length. During the spring, summer and early fall we do on site sewer pump outs FREE of charge for over night and weekly guests to offset no sewer at the sites. We do dump during the winter if the temps allow it as well. We also have a dump station and water at our office to fill your holding tanks. We hope you stay with us again if in our area, until then happy camping and safe travels. Park is very tight quarters coming in expect your privates to draw up as you cross the small bridge to check in, big rigs be careful. Then after you check in you will have to do a tight turn around to go back to the pull-throughs. And when you get there- no sewer. The dump is back at the check-in area. Dont get me wrong this place is ok, but if you want full hookup keep traveling. We camped at Oak Creek Campground in a Fifth Wheel. Thank you for your feedback and your business. 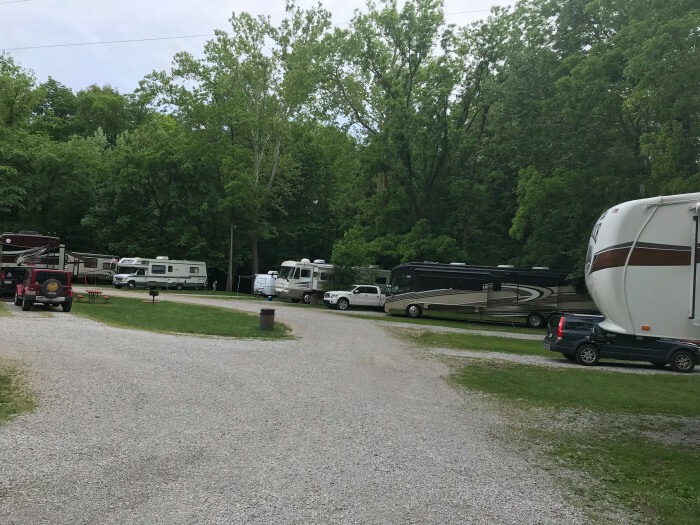 You are correct that our roads are a little tight but for over 47 years many rvs large and small have made the way in and out without issue. We also get deliveries weekly from semis that have no problems, but as you said paying attention is key. We advertise very clear online and if asked that we do NOT have sewer at the sites. We do pump out on site for FREE on Mon, Wed, and Fridays if needed. They location of the dump station is just past check in so you may dump when you arrive before setting up or when you check out. The campground was built by my grandparents in 1969 when rvs were much shorter, hence the tighter roads, and really had no need for sewer then. Happy camping and safe travels. Thank you for the feedback. We are glad that for the most part you enjoyed your stay with us. Our ladies room is slated to have the main flooring as well as shower walls redone in the fall. The vinyl on the floor as worn worse than expected, it is only 3 years old. The tile floors in the showers are more recent but the yellow wall tile is out of date. New sinks and faucets will also go in when we redo the shower walls, and main floors. We hope that you come back to see us and the newly updated restrooms in the years to come. Mens room remodel will be done in 2018. Also we do clean each day noon to 1, and spot check after that. The restrooms as you can imagine are used and unfortunately sometimes abused. If there is anything that sticks out in your mind that needs better attention please email me at robertmcdonald@oakcreekpavilion.com thanks and safe travels. Overpriced for what you get. Filthy bathrooms, even though they are closed from 12-1 every day. Out of soap and paper towels in men's room, told to wait until cleaning time. This was at 9am! Still same trash and dirt in showers after cleaning time. Men's room is NOT handicapped accessible. My husband is a big guy with mobility issues and struggled big time. Very rude owners! Upkeep is at a minimum here. It seems they cater to drunks who like bad country music. If you can call it that. Will never return here again. We camped at Oak Creek Campground in a Tent Trailer. Just drive on down the road. Or stay in the parking lot at the nearby truck stop and use their showers in the morning. It's free to park and $12 to shower. The folks are a lot more polite and the showers there are amazing. Had reservation, confirmation letter, they charged my bank account for one night. Arrived at 5:30PM, they didn't have a place for us, said that we had called and cancelled the reservation, which we did not. Left us scrambling to find a place to stay, not easy on a Saturday evening. Lots were very close together. We camped at Oak Creek Campground in a Travel Trailer. It is unfortunate that this customer cancelled and basically forgot. We gained nothing by refunding them their money. I do not believe I can legally post a copy of the refund receipt as it has their cc info on it and other transaction info but I assure you I have our copy stapled to her cancelled reservation form, we hang on to all cancellations just in case. We get people calling a rebooking weeks after they have booked on accident and occasionally someone will cancel when they meant to cancel elsewhere. It happens. The review of our site size is not relevant as this person never stayed here. We have sites ranging from 40' long to 72' long. Site widths including parking pad ranging from 18' wide for our smaller 1 night sites to over 30' wide on some of our back ins. I wasn't expecting to like this park as much as I did. The owners were very nice and the pool was clean. This is an older park, but I found it to be very organized and easy to get around despite some narrow roads. We enjoyed our stay. There were a lot of commercial businesses nearly, but overall it as no noisier than most campgrounds. We would definitely stay here again. Easy on and off the Highway. We camped at Oak Creek Campground in a Fifth Wheel. Would give you the pros and cons but have little to say as for pros. As for cons, I'll start with quiet hour starts at 11:00 and it is LOUD til the last minute. The sites are dirty grey crushed rock that tracks white if there is the least amount of dew/moisture on the ground. Bath/shower are smaller than a closet and if ya don't mind large spiders/ants/other crawlers...there is hot water. I believe we were but one of two motorhome in the entire park. I guess that should have told me something from the beginning. But then, we were very tired and looking for a quiet nite (?) along the creek. If your needing the same...keep on movin cause this sure isn't it. I'm going to be very generous giving this campground a 3. We camped at Oak Creek Campground in a Motorhome. This is an older park so the facilities could use some updating, however they were reasonably clean. The site was a back in with plenty of room. The connections were at the rear so extra hoses are needed. The pull through do have centrally located hook ups. The site was level. We camped at Oak Creek Campground in a Fifth Wheel. This is a lovely well-cared for campground. We were just an overnight stop, but it has a list of many activities that go on there and recommendations for places to visit. It has a lovely creek along one side and a great playground for children. One section has more permanent folks and the area has a homey feel to it with folks who really take care of their sites. I would not hesitate to stay there for a longer visit. Quiet and peaceful, and the staff is excellent. We camped at Oak Creek Campground in a Fifth Wheel. If you are only an overnight stop, there are pull through spots in an area near the creek. Our site 39 was in that section. The more permanent sites are in a sections that does not seem to be used for non-permanent visitors. 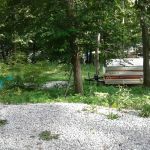 The entire campground is very well maintained. Tight road leading into campground. Mostly full-time and seasonals. There was a section with 5 pull-thru for overnighters. Had to do a U-turn which was quite interesting! Got in late and had instructions on door where hose was to put water in our tank - lines frozen at sites. Also envelopes to put payment in. Okay for overnight. We camped at Oak Creek Campground in a Motorhome. 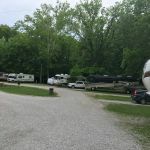 Are you affiliated with Oak Creek Campground ?